An exquisite daytime aerial view of the Las Vegas Valley. Nicknamed the "Jewel of the Desert" poster, this is a must to own. 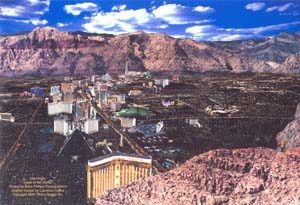 This Las Vegas view is breathtaking and is a great poster dipicting the the major Las Vegas casinos. Poster measures 24 inches wide by 18 inches tall. Printed on quality paper, suitable for framing. FREE shipping within the United States. Orders processed within 48-hours and shipped First Class mail. Regular retail is $19.95 per poster.